For he is a child with a lot of self respect. All this while, I have asked myself the Special needs mom question “How will he live without me “? This really touched me. My son is much older, and while his special needs are different, I still wonder about his future and if/when he will live on his own. I will never stop worrying about him. Such a touching post! Loved it! This is something I've gone through myself -- we say goodbye to a way of life and start out on a new one. Love definitely makes it easier -- for all parties, I imagine. I love the idea of giving our children wings as well as roots. Thank you for another wonderful post. I like his new bed, and the picture of him starting over in a brave new world. Weepy here, not just a little but a lot. This was such a moving post for me k, and quite possible one of my all time favorites! This is such a touching and wonderful post. I teared up when I read the words of Khalil Gibran. My dad once told me about the same thing. "how will I live without you?" and my heart shatters into a thousand pieces that she gathers up and heals once again. love how you always write from your heart K.
Congratulations to all of you. 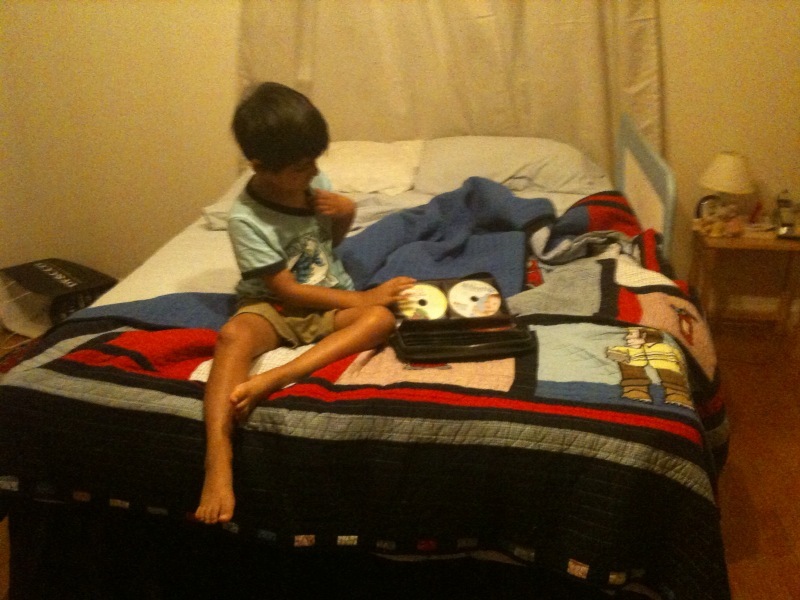 How grown up R looks, on his big bed with his DVDs! I love the Kahlil Gibran quote. Sweet Honey in the Rock does a beautiful musical setting of those words -- I linked on Elvis Sightings to a YouTube of a trio singing the arrangement a while back. Such beauty in your post, and in your family. Hope your trip is going well. I'd love to get together soon! "How will I live without you?" indeed! I often wonder the same about my kids! Hugs to you! catching up on your blog and as always loving what i read. So touching...your son is truly blessed to have such sensitive, amazing parents! I think every mother can relate to the struggle we feel as we release our children to independence. It isn't easy, but so necessary. Hugs! Now I'm crying and not sure what to say, but it's a good cry. Your son is strong and wise, like his mother...remember this. I understand the worry x3 of how will they live without me and more difficult, how will I live without them here with me. "They come through you but not from you..."
Thank you for sharing the poem. I'm printing it. Feeling the emotion of current and future separation from our children now and esp with your touching post. I once heard a speech about 'lasts' of childhood behaviors. You have given apt tribute to a 'last'. Sending congratulations to you, DH and the respectable R.
So, so true. I think sometimes I need my kids more than they need me. My biggest last was when my 11yo autistic son was finally potty trained last summer. The last pullup. It was great. We tend to concentrate on the firsts, instead of the lasts. With our kids, sometimes the lasts are so much more important. Catching up on your blog after being unplugged! I just love your "voice" and have enjoyed reading a few posts all in a row! The big boy bed and the stretch for independence - such biggies. "For he is a child with a lot of self respect." You have a beautiful, soulful way with words. This is a good step for you all. I hope you'll write about how well it is going. So beautifully written as always. As I see M pulling away followed someday by E and then finally little M, I will take comfort that I have done my job. Our job is to give them wings so they can fly away (wherever that might be) and we are so so fortunate to have landed that gig. So very true!!! I have chronicled (in my heart) all the "lasts" of Itty Bit. And taken time to mourn each one. And sometimes we don't even realize that something is the "last" until you miss it one day and realize how far you've come. (Yes, I am dreadfully sentimental and I carried my sound asleep son to bed recently and realized that it had been SO long since I'd rocked him to sleep while standing... something he couldn't live without for a year). This post made me wistful... and it seems we are always in some type of transition because our children are constantly growing and developing and BECOMING. And part of that success is a heartbreaking independence. Thank you for writing so beautifully about it. I admire your Mother's heart so very much! Very touching...loved it! I hope his transition continues smoothly. My MIL used to say a quote from a newspaper taped to her wall in her living room...something about the greatest gift you can give your children being the roots (something about heritage) and wings of independence. I wish I could remember the exact wording but can't. I know I continued to think of that quote when my older daughter left from home so long ago. Cute pic of R and his big boy bed! thank you for sharing your thoughts and your heart. I hope the transition goes well...these things are so hard. Beautiful... I can sooo relate to this. I don't know how I will handle it when my babies are totally independent :(. Letting go, even in little baby steps, is so hard. We've been putting Bitty to bed in his own bed for a while now, but I admit that I secretly love it that most mornings I wake up to find him next to me :). And secretly miss when his big brothers did the same, even though it was very crowded when they did!